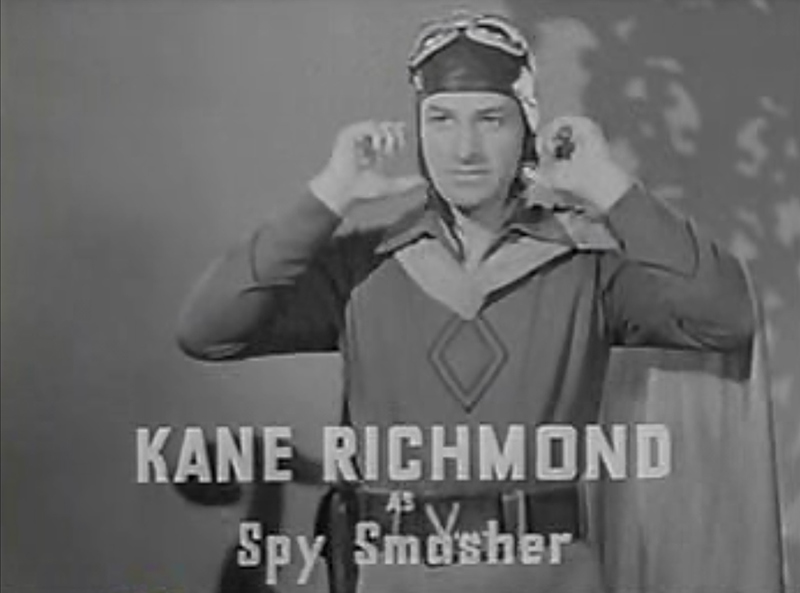 Though Republic had the best stunt men in the business on hand, with the likes of Carey Loftin and David Sharpe and even Yakima Canutt as the film’s “Ramrod”, star Kane Richmond, who was quite an athlete, often insisted on doing his own stunts as “Spy Smasher” (this was back in the days when insurance issues were a lot more loose on movie sets). 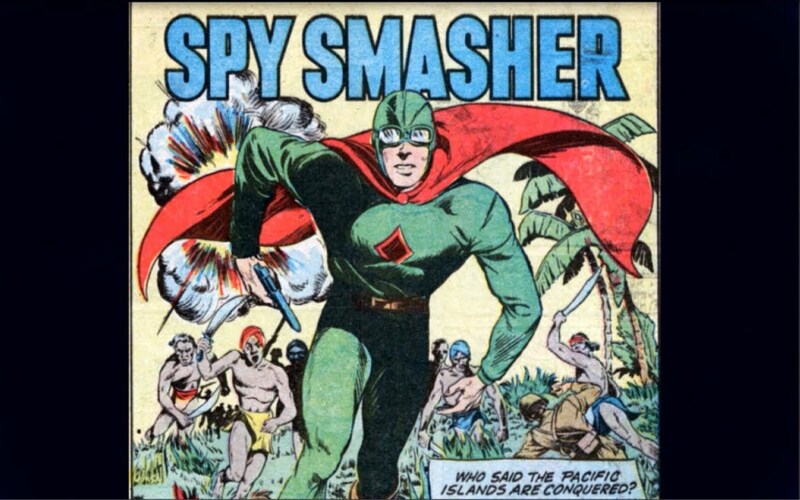 Spy Smasher has absolutely fabulous stunts that remind you how fun movies were before CGI came into existence. These knuckleheads go all out in the fight scenes – leaping around, flipping each other, bludgeoning one another with balsa wood chairs, Spy Smasher roars around on a motorcycle like a madman, a wooden tower gets blown up and collapses, a motor boat takes on a submarine, etc. 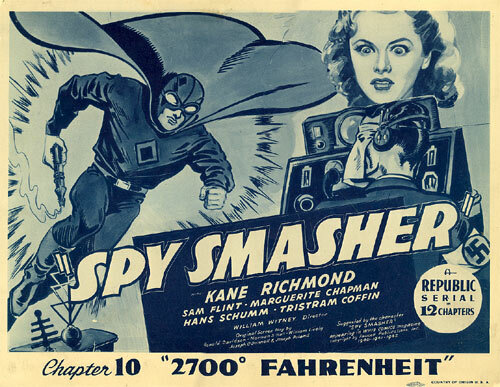 Spy Smasher was directed by William Witney for Republic Pictures. Glossary of film terms as defined by the Wikipedia – B movie – is a low-budget commercial motion picture that is not definitively an arthouse or pornographic film. In its original usage, during the Golden Age of Hollywood, the term more precisely identified a film intended for distribution as the less-publicized, bottom half of a double feature. Although the U.S. production of movies intended as second features largely ceased by the end of the 1950s, the term B movie continued to be used in the broader sense it maintains today. In its post–Golden Age usage, there is ambiguity on both sides of the definition: on the one hand, many B movies display a high degree of craft and aesthetic ingenuity; on the other, the primary interest of many inexpensive exploitation films is prurient. In some cases, both may be true. In either usage, most B movies represent a particular genre—the Western was a Golden Age B movie staple, while low-budget science-fiction and horror films became more popular in the 1950s. Early B movies were often part of series in which the star repeatedly played the same character. Almost always shorter than the top-billed films they were paired with, many had running times of 70 minutes or less. The term connoted a general perception that B movies were inferior to the more handsomely budgeted headliners; individual B films were often ignored by critics. Latter-day B movies still sometimes inspire multiple sequels, but series are less common. As the average running time of top-of-the-line films increased, so did that of B pictures. In its current usage, the term has somewhat contradictory connotations: it may signal an opinion that a certain movie is (a) a genre film with minimal artistic ambitions or (b) a lively, energetic film uninhibited by the constraints imposed on more expensive projects and unburdened by the conventions of putatively “serious” independent film. The term is also now used loosely to refer to some higher budgeted, mainstream films with exploitation-style content, usually in genres traditionally associated with the B movie. From their beginnings to the present day, B movies have provided opportunities both for those coming up in the profession and others whose careers are waning. Celebrated filmmakers such as Anthony Mann and Jonathan Demme learned their craft in B movies. They are where actors such as John Wayne and Jack Nicholson first became established, and they have provided work for former A movie actors, such as Vincent Price and Karen Black. Some actors, such as Béla Lugosi and Pam Grier, worked in B movies for most of their careers. The term B actor is sometimes used to refer to a performer who finds work primarily or exclusively in B pictures. 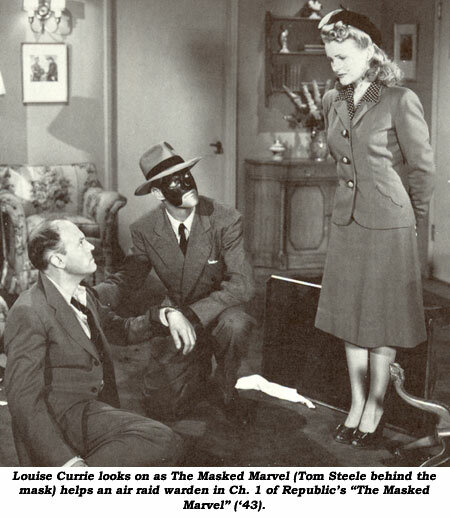 In the Masked Marvel (1943), Tom Steele played the lead, did all his own stunts, played a bit part as a heavy and doubled three other actors to do all their stunts, and he never got any billing on the series. It was common during these days to not give credit to the stuntmen on these pictures. It’s interesting to note, that he did so much stunt work on this film, that at one point, there’s a scene in which Tom Steele is being chased up a fire escape by the Masked Marvel. Now, knowing that Tom played the Masked Marvel in all the action scenes, he is literally chasing HIMSELF up that fire escape! As a side note, Stuntmen are often selected because of their resemblance to the star they are doubling for. In contrast to this, many of Republic Pictures’ western stars in the 1940s and early 1950s, such as Allan Lane, Bill Elliot, Rex Allen and Monte Hale, were selected in part due to their resemblance to Steele, who would do their stunts. His trick for keeping his hat on in fight scenes in these pictures (so the audience couldn’t tell it wasn’t the star) was to put rubber surgical tubing in the sweatband to make it fit tight. The Masked Marvel is one of the kings of action serials. By my count there were 19 fights (four or more men fighting in two or more rooms were counted as one fight), an even 20 killings by gunshot, 15 deaths by miscellaneous means (explosions, knifes, auto accidents, to include the same shot of a car going over a cliff in Episodes 2 and 8, etc.) and 15 explosions (including cars going over a cliff and the three explosions at the beginning). Glossary of film terms as defined by the Wikipedia – Masked Mystery Villain is a stock character in genre fiction. 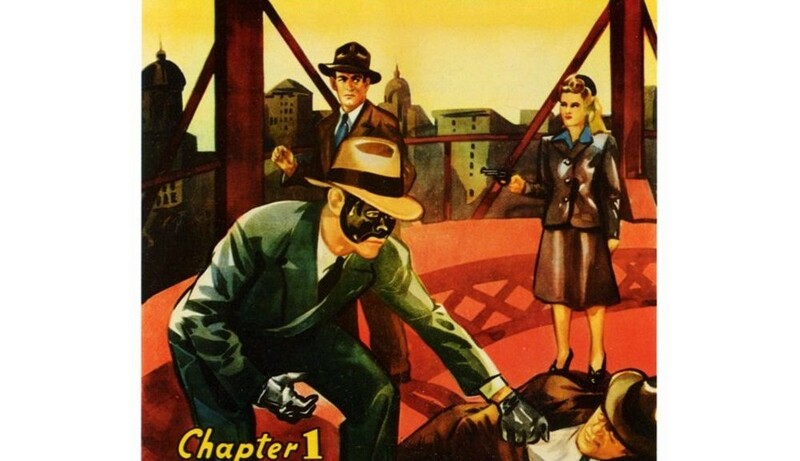 The Masked Mystery Villain was frequently used in the adventure stories of Pulp magazines and Movie Serials in the early twentieth century. They can also appear in Crime fiction to add to the atmosphere of suspense and suspicion. The “Mask” need not be literal (although it often is), referring more to the subterfuge involved. He or she is the often main antagonist of the story, often acting behind the scenes with henchmen confronting the protagonists directly. Usually, the protagonists must discover the villain’s true identity before they can be defeated. Often the Masked Mystery Villain will turn out to be either one of the protagonists themselves or a significant member of the supporting cast. The author may give the viewer or reader clues, with many red herrings, as to the villain’s identity – sometime as the characters find them and sometimes for the audience alone. However, the identity is not usually revealed to the audience before it is revealed to the characters of the story. Even the villain’s henchmen rarely know the truth about their master. The concept was reversed in the serials “The Lone Ranger” and “The Masked Marvel”, where the true identity of the hero is unknown and a number of characters remain possible candidates until the end. At a time when men were more prominent as stunt performers, even going so far as to double for the female stars of the movies, it’s refreshing to come across a true cowgirl who starred in her own films as well as did her own stunts. It’s time once again to highlight the heroine and not the hero. Evelyn Finley started out in films as a stunt double and then went on to act in her own roles. She preferred the stunt work, and so later on, went back to doubling in her later pictures. 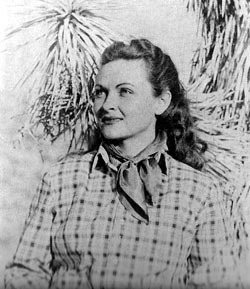 In Ghost Guns (1944), she starred in the lead role, and also performed her owns stunts, a regular event throughout her early career, and she received high praise for her riding stunts in this movie. 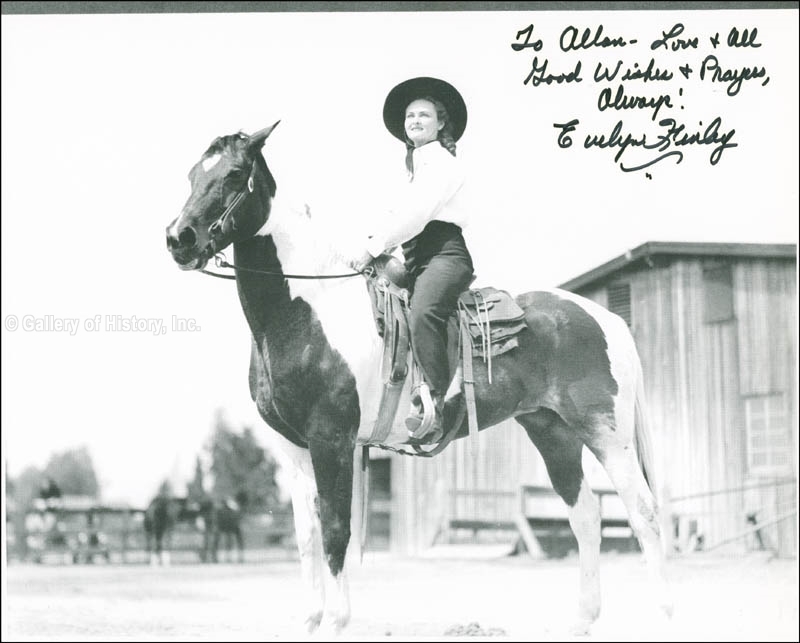 She has often been called one of the greatest horseback riders in film history, joining the company of Nell O’Day and Betty Miles. Despite her age, she continued to work in the stunt business, either as an advisor or as an actual stunt performer, into the mid-1980s. Her last film in which she worked as a stunt technical advisor was the 1985 film Silverado, starring Kevin Costner and Scott Glenn. Here’s a great little interview about her times during the making of these moves. Sunset’s not the best interviewer, but you definitely get the feeling that she’s loved performing and riding. 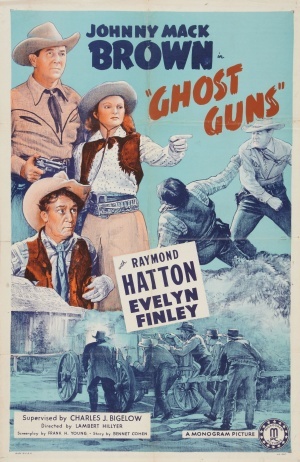 Ghost Guns was directed by Lambert Hillyer for Monogram Pictures. History of film companies as defined by IMDB: Monogram Pictures Corporation is a Hollywood studio that produced and released films, most on low budgets, between 1931 and 1953, when the firm completed a transition to the name Allied Artists Pictures Corporation. Monogram is considered a leader among the smaller studios sometimes referred to collectively as Poverty Row. The idea behind the studio was that when the Monogram logo appeared on the screen, everyone knew they were in for action and adventure. It is now a division of Allied Artists International. History of film companies as defined by IMDB: Poverty Row – While some Poverty Row studios came and quickly went after a few releases, others operated on more or less the same terms as—if vastly different scales from—major film studios such as MGM, Warner Bros., and Paramount Pictures. From 1919 until its reorganization in 1924, Harry Cohn’s CBC Productions (later to become Columbia Pictures) was considered a Poverty Row studio. Tiffany Pictures was in operation from 1921 through 1932 as both a production company (about 90 films) and a distributor. Mascot Pictures was formed in 1927 by Nat Levine, and merged into Republic in 1935. Larry Darmour Productions flourished from 1927 through the 1930s, mainly on the popularity of its Mickey McGuire short film series starring Mickey Rooney. Damour was also the principle producer within Majestic Pictures until 1935. Monogram Pictures was created in 1931 by the merger of Sono Art-World Wide Pictures with W. Ray Johnston’s Rayart. After the attempted 1935 merger of Monogram into Republic, Johnston took Monogram independent again, and in the following decades produced everything from college/teen musicals starring popular swing bands to versions of classics like Oliver Twist and the final films of Kay Francis. It evolved, in relatively good financial condition, into Allied Artists in 1953. Republic Pictures was organized in 1935 when Herbert J. Yates combined six other established poverty-row companies, Monogram, Mascot, Liberty, Majestic Pictures, Chesterfield, and Invincible with his Consolidated Film Laboratories. Republic began by releasing serial shorts and Westerns with Gene Autry in the 1930s before eventually riding the success of eventual superstar John Wayne and embarking on more ambitious projects, such as 1953’s Wayne hit, The Quiet Man. Grand National Films Inc. was organized in 1936 with some significant talent (James Cagney and director Charles Lamont), but could not survive without its own distribution channel. It folded quickly in 1939, and released about 100 films altogether. Producers Releasing Corporation emerged in 1939 and lasted until 1946, when it was absorbed into Eagle-Lion Films. 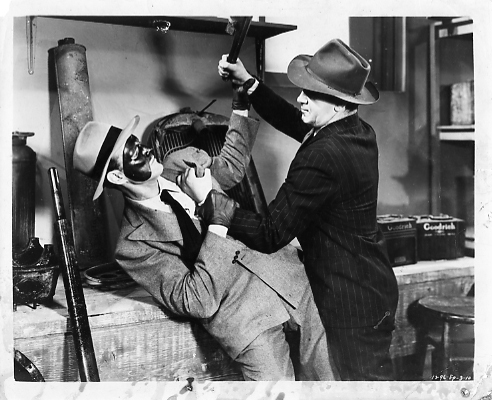 PRC presented a steady output of westerns, serials, gangster movies, with occasional high spots, such as Edgar G. Ulmer’s Detour, and their 1944 Minstrel Man, nominated for two Academy Awards. The smallest studios, including Tiffany Pictures, Sam Katzman’s Victory, Mascot and Chesterfield often packaged and released films from independent producers, British “quota quickie” films, or borderline exploitation films such as Hitler, Beast of Berlin to supplement their own limited production capacity. Sometimes the same producers would start a new studio when the old one failed, such as Harry S. Webb and Bernard B. Ray’s Reliable Pictures and Metropolitan Pictures. There’s been a perpetual myth that the truck stunt in Raiders of the Lost Ark (1981) by Terry Leonard was influenced by a stunt by Yakima Canutt in the movie Stagecoach (1939), but that is not entirely true. 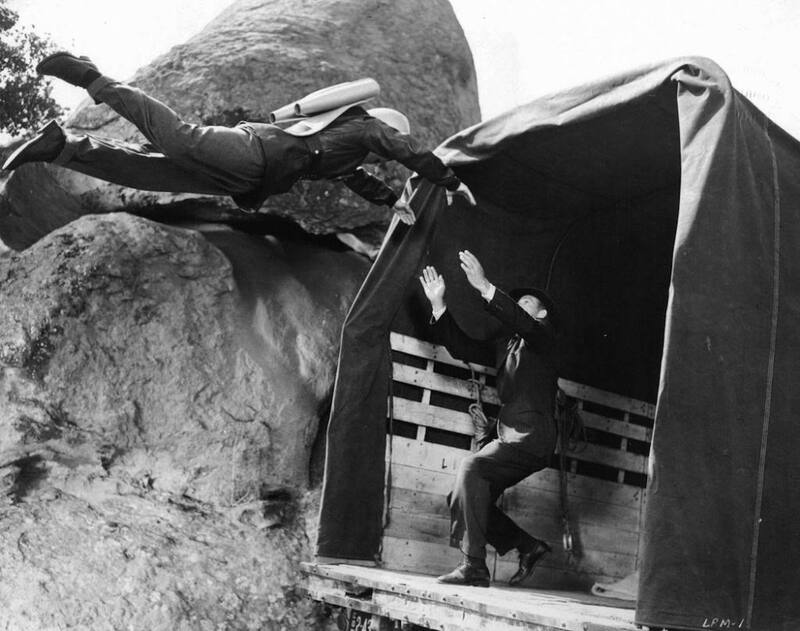 Yakima Canutt is definitely the original creator and performer on the stunt, but I think the original idea for the stunt germinated in Stagecoach, then he modified and improved on the stunt in a film series the same year, called Zorro’s Fighting Legion (1939). You can definitely see the progression throughout both movies, and Terry Leonard always wanted to tip his hat by recreating the stunt, first in a botched version in The Legend of the Lone Ranger (1981) and then perfecting it for the truck scene in Raiders of the Lost Ark. 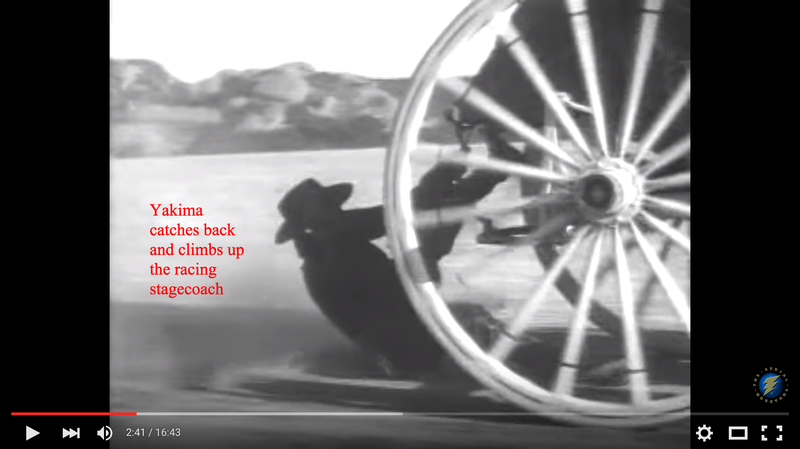 In Stagecoach, Yakima Canutt does two stunts that are of particular note. In the first one, as an Indian, Canutt rides up to the lead horses of the stagecoach, he jumps off his horse and lands between the two horses. There he gets shot by an actor on the stagecoach twice, slips between the two horses and holds on for a bit as he is dragged on his back. When he gets the chance he lets go and lets the other 4 horses and the stagecoach itself pass over him, then he turns over and gets up and runs off. In the second stunt, Yakima Canutt doubles John Wayne and performed the stunt where John Wayne’s character jumps from the stagecoach onto the runaway team. He then jumps from that set of horses to the middle set and then to the two lead horse, while the stagecoach races at top speed. Once on the lead horse he jumps on the saddle and slows the stagecoach down. Now, for the Zorro’s Fighting Legion stunts, Yakima Canutt, was working with Repubic Pictures, where he performed many stunts for their movie serials over the years. 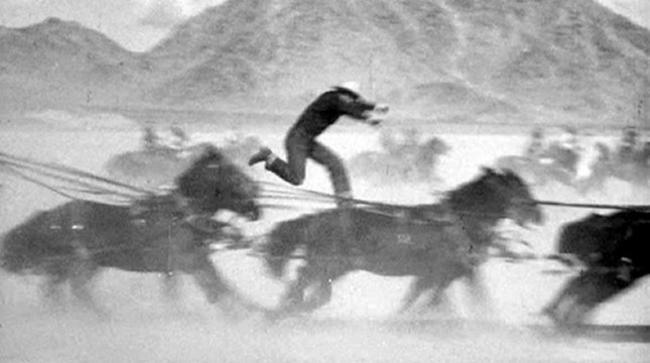 This particular stunt appears in Chapter 7 of Zorro’s Fighting Legion, where Canutt (standing in for Reed Hadley as Zorro) attempts to stop a stagecoach. He rides alongside the horses pulling the stage and jumps onto the back of the lead horse. Then, with bullets whizzing past his head, he swings between the horses and begins to work his way back to the stagecoach. He slides under the stagecoach doing a nifty flip tumble then grabs hold of the back of the stagecoach (I have no idea how he was able to hold on! ), climbs up the back, crawls over the top and then punches out the driver. Except for the flip tumble it’s almost exactly like the one in Raiders of the Lost Ark. 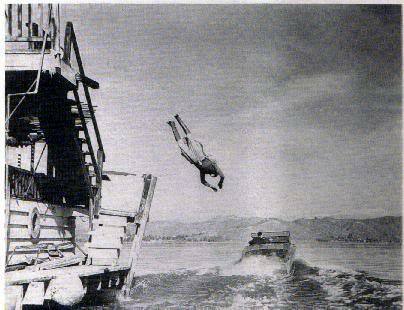 Yakima is considered by many to be the first legendary stuntman. 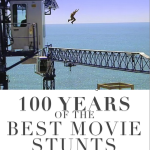 He was the first one to be recognized by the Academy of Arts and Sciences for his work as a stuntman. 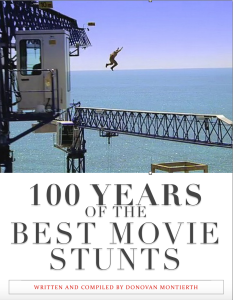 In 1967, he was given an Honorary Academy Award for “achievements as a stunt man and for developing safety devices to protect stunt men everywhere”. 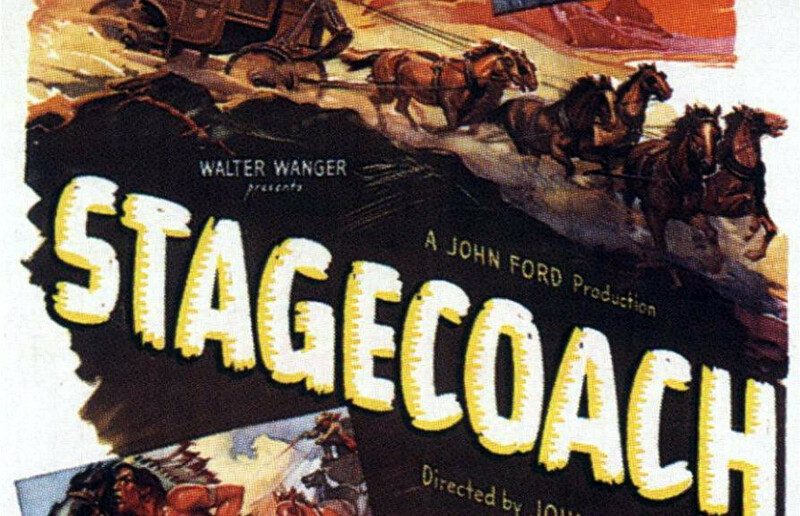 Stagecoach was directed by John Ford for Walter Wanger Productions. Zorro’s Fighting Legion was directed by William Witley and John English. History of film companies as defined by Wikipedia: Walter Wanger Productions – In 1923, Walter Wanger was appointed head of Paramount’s Long Island Studio. Shortly after, he was made chief of production, holding that position until 1931. After leaving the company due to personality clashes with new senior management, he had brief spells with Columbia and MGM, producing several big hits, such as The Bitter Tea of General Yen (1933) and Queen Christina (1933). Nonetheless, he didn’t get on particularly well with either Harry Cohn or L.B. Mayer and decided to turn independent, releasing his films through Paramount and United Artists. By 1936, Walter Wanger’s own production company had the most substantial star roster of any independent filmmaker in Hollywood, including Madeleine Carroll, Charles Boyer, Henry Fonda and Sylvia Sidney. Wanger’s first major success as an independent was The Trail of the Lonesome Pine (1936), the first Technicolor feature for Paramount, and also the first to be shot primarily outdoors. 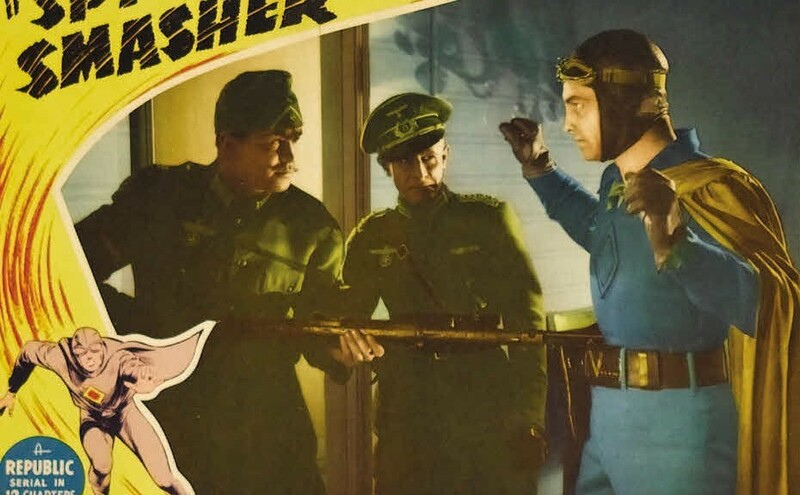 In between solid black & white action films and dramas like You Only Live Once (1937) and Algiers(1938), Wanger also produced several expensive all-colour extravaganzas, not all of which paid off at the box office (point in case, Vogues of 1938 (1937), which failed to recoup its cost of $1.4 million). This rather forced United Artists to keep a closer reign on his future expenditure. However, by the end of the decade, Wanger’s reputation increased, with films like Stagecoach (1939) and The Long Voyage Home (1940) (forJohn Ford) and Foreign Correspondent (1940) (for Alfred Hitchcock). Between 1946 and 1949, Wanger succeeded both in strengthening his own production company and in establishing a distribution network (in conjunction with the independent owners of Film Classics), the Wanger-Nassour Releasing Organisation. Inevitably, the financial vagaries of independent production were beginning to take their toll. Already hamstrung by the financial woes of one of his subsidiaries, Diana Productions (formed in partnership with his wife Joan Bennett, screenwriter Dudley Nichols and director Fritz Lang),Wanger badly overextended himself in his financing of the 145-minute studio-bound Technicolor epic Joan of Arc (1948), starring Ingrid Bergman. The venture effectively bankrupted another of his production companies (Sierra Pictures), set up with Bergman exclusively for the making of the expensive fiasco. “Joan of Arc” ended up being shunned by audiences (who found it long and boring) and critics (who thought it naïve and altogether missing its spiritual mark) alike. Wanger’s financial miscalculation was further compounded in 1951, by his shooting of his wife’s paramour. It landed him in jail for four months for attempted murder.